The Islamic finance and banking industry has grown tremendously during the past few years from an alternative form of financial intermediation for Muslims to a complete, competitive and integral component of the mainstream global financial system that serves both Muslims and non- Muslims. According to Ernst & Young’s World Islamic Banking Competitiveness Report 2013, global Islamic banking assets have grown annually by 19 percent on average, and are set to cross US 1.8 trillion (RM5.56 trillion) in 2013. Most Islamic finance and banking scholars subscribe to the view that a banking system constructed to promote risk-sharing, co-operation and mutual assistance would reflect the principle of profit-loss sharing (PLS) that is embodied in mudarabah and musharakah; hence, these should ideally be the cornerstone of Islamic banking. It is believed that Islamic banks need to achieve socioeconomic objectives through the use of mudarabah and musharakah contracts. Despite the quasi-unanimity of Islamic finance and banking scholars on the importance of mudarabah and musharakah in the Islamic banking system and the dominance of the concept of PLS in the theoretical literature, the allocation of most Islamic funds is confined to short-term and low-risk investments with a slim profit margin (Dar & Presley, 2000). mudarabah and musharakah only constitute a negligible portion of both the assets and liabilities of Islamic banks. In Malaysia, even though the development of products and services in the Islamic banking system is very encouraging, financing products based on the principles of mudarabah and musharakah are almost non-existent. The assets and financing activities of Islamic banks in Malaysia appear to be concentrated more on debt-based contracts such as bay' bi thaman Éjil (BBA), murabahah and ijarah. The concentration on non-PLS modes of financing also raises the question of whether Islamic finance and banking operations in general are totally Islamic or whether the name is merely used as a “veil” by conventional banks to attract funds from Muslim investors. Given the above scenario, this study has been conducted to find the reasons behind the paradoxical differences between what is being idealized and what is being practiced in the industry. 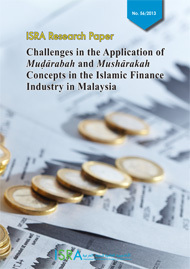 The study examined the issues within the scope of the Malaysian Islamic finance and banking industry. The findings of this study were based on primary data gathered through interviews with selected Islamic financial institutions (IFIs) as well as secondary data obtained from reports published by Bank Negara Malaysia (BNM) and IFIs. The study also conducted a detailed analysis of the following statutes insofar as mudarabah and musharakah are concerned: the Partnership Act 1961 (Act 135) (‘PA’), the Civil Law Act 1956 (Revised 1972) (Act 67) (‘CLA’) and the Islamic Financial Services Act 2013 (Act 759) (‘IFSA’). This study found that in Malaysia, mudarabah- and musharakah-based products constitute a very small portion of IFI assets. There are a number of reasons why IFIs seem to be reluctant to operate or implement mudarabah and musharakah. These include high risk levels, the familiar role of the bank as a fund provider rather than a partner or investor, inadequate demand from customers, complexity in implementing the products, stringent regulations and lack of expertise and skilled staff. The Capital Adequacy Framework for Islamic Banks adopted in 2012 by BNM is also found to have a negative impact on the IFIs if they were to adopt mudarabah-based and musharakah-based products. This may further discourage IFIs from offering mudarabah- and musharakah-based transactions. From the legal perspective, our analysis shows that there are some provisions in the PA which cannot accommodate the concept and practice of mudarabah and musharakah. The provisions are section 3, which states that the partners’ relationship in a partnership venture is to carry on business together with a view to profit; section 6, which requires establishment of a firm; and section 47(2), which requires that the number of the partners in the partnership must not be more than twenty persons. Thus, it is of paramount important that these provisions in the PA be amended to allow mudarabah and musharakah products to be recognized under the PA and thus become enforceable. Alternatively, the researchers suggest that Parliament pass a special law to deal specifically with mudarabah and musharakah products. Analysis reveals that there is no law that unequivocally governs mudarabah and musharakah. The question is: what is the governing law for mudarabah and musharakah? Is it the CLA or PA or Shari'ah as prescribed by the IFSA or the Central Bank of Malaysia Act 2009 (CBA)? One can argue that the governing law is the Shari'ah, but there is no detailed Shari'ah-based written law passed by Parliament for mudarabah and musharakah so far. It is submitted that, due to the absence of Shari'ah-based written law governing mudarabah and musharakah, the baseless presumption that the governing law is the Shari'ah, as prescribed under the IFSA and the CBA, can cause fatal legal problems to the practice of mudarabah and musharakah products in Malaysia. Further, there are no exemption provisions under the CLA and the PA to exempt mudarabah and musharakah from their operations. Thus, the governing law for mudarabah and musharakah, it is submitted, is not clear. In addition, if the Shari'ah is the governing law, then which madhhab will be the prevalent law? Will it be the Hanafi or Hambali or Shafie or Maliki School, or opinions or guidelines provided by the SAC or the Shari'ah Committee? These issues have not been clearly resolved by the IFSA and the CBA. The roles of existing third-party guarantors such as Syarikat Jaminan Kredit Perumahan and Credit Guarantee Corporation (CGC) should be enhanced so that they can also cover risks from mudarabahand musharakah-based products. In this matter, the relevant authorities should streamline the legislation regarding the roles and responsibilities of thirdparty guarantors in the context of mudarabah and musharakah financing. The IFIs should establish subsidiaries that will play roles similar to those of a venture capitalist. It is these subsidiaries that will focus on looking for potential projects and providing them with financing based on mudarabah and musharakah contracts. The financing model used by KFH for its Pavilion Project, or by Affin Islamic Bank to provide financing for a highend residential development in Penang in 2008 with Mutiara Goodyear, or more recently to develop VERVE Suites KL South with Albatha Bukit Kiara Holdings could be used as examples. The IFI should ensure that its subsidiary is staffed with an adequate number of people who have a good understanding of mudarabah and musharakah contracts and who are aware of the risks involved. It is also important that this subsidiary be given an exemption or a grace period from being subjected to the Basel III requirements. The local Institutes of Higher Learning (IHLs) also have roles to play in providing the human capital needed by the IFIs. As such, a closer collaboration should be forged between the IFIs and the IHLs in identifying the types of training and courses that should be offered to produce specialists in mudarabah and musharakah contracts. Some sections in the PA and the National Land Code (NLC) need to be revised and certain amendments be made so as to make mudarabah and musharakah IFIs products harmonious with the existing legal and regulatory framework besides being in compliance with the Islamic law requirements. The relevant authorities should also look into the issue of negligence, especially the burden of proof regarding the existence of negligence, to mitigate the risks of mudarabah or musharakah contracts from being lopsided to the detriment of the IFIs. In the selection of a potential mudarib, only those who are capable of bringing in some capital should be given priority. By requiring the potential muÌÉrib to provide part of the capital, the problem of asymmetric information could be reduced. The IFIs could also be encouraged to offer mudarabah- and musharakah-based product by providing special tax treatment such as tax waivers and tax neutralization for all proceeds obtained from financing projects using mudarabah and musharakah contracts. The special tax treatment given can be justified on the grounds of the higher level of risks that IFIs need to assume in providing these products. In order to encourage more entrepreneurs to use mudarabah and musharakah contracts, they could also be given special tax treatment on any proceeds obtained from projects financed using these contracts. The government should intervene more directly in order to increase the use of mudarabah and musharakah contracts. It is suggested that the government and the government-linked companies be encouraged to use mudarabah and musharakah contracts in financing their development projects. The government should use mudarabah and musharakah contracts for its various financing schemes offered through agencies such as the SME Bank, the Agrobank or the Malaysian Industrial Development Board (MIDF). Currently, the government has almost 100 types of funds or financing schemes for SMEs. Therefore, there is clearly a lot of room for the government to experiment with the application of the mudarabah and musharakah contracts. The IFIs should have a paradigm shift in the way they view their role as Islamic banks and their understanding of the philosophy underlying Islamic banking activities. IFIs should also re-examine their role as fund providers and transform themselves into becoming service providers. It is suggested that IFIs be focused on their role as service providers (trustees) and delegate their investment activities to separate entities; i.e., their subsidiaries. The IFIs as well as relevant authorities should increase the public’s awareness of mudarabah and musharakah contracts and their importance, especially in terms of the economic development of the Ummah. This can be achieved through extensive and effective promotions through various platforms such as public forums, conferences and electronic media.